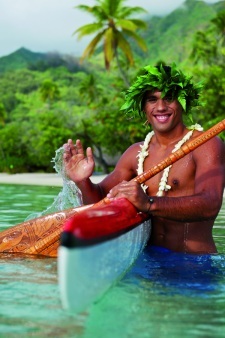 The most popular sport in Polynesia is the outrigger canoe or “va’a”. It existed well before the arrival of the Europeans. Indeed, the first Polynesians were great navigators and had already discovered Tahiti and Her Islands on these outrigger canoes. Since the beginning of the Seventies, the “va’a” has been spectacularly revived. The Tahitian Federation of Va’a brings together more than 5,000 Polynesians. Moreover, there are approximately 30,000 people fond of this discipline. 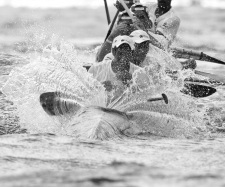 Several times a year, “va’a” races animate our lagoons like the “Super Aito” race in August. The most popular race named “Hawaiki Nui Va’a” is yearly organised. This race is made up of three stages, connecting Huahine to Bora Bora in 128 kilometers. It is a formidable sight gathering many Polynesians for a sporting and festive moment. During this extraordinary event, the participants not only come from Tahiti and Her Islands, but also from New Caledonia, Hawaii and even from Metropolitan France.